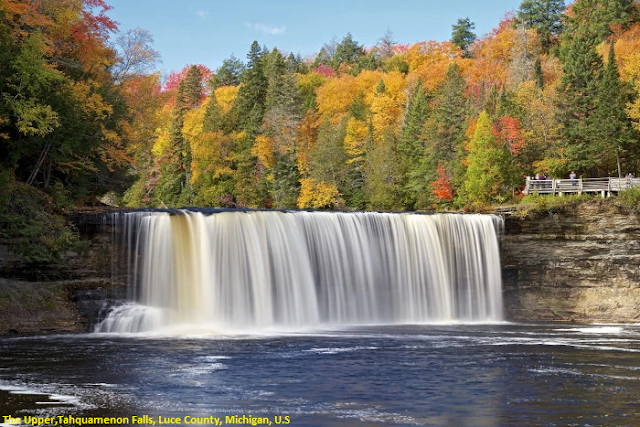 The Tahquamenon Falls are two different waterfalls on the Tahquamenon River. Both sets are located near Lake Superior in the eastern Upper Peninsula of Michigan. The water is notably brown in color from the tannins leached from the cedar swamps which the river drains. The upper falls are more than 200 feet (60 m) across and with a drop of approximately 48 feet (14 m) During the late spring runoff, the river drains as much as 50,000 US gallons (190,000 L) of water per second, making the upper falls the third most voluminous vertical waterfall east of the Mississippi River, after Niagara Falls and Cohoes Falls, both in New York State.